One of the highlights every other year in the Principality of Monaco is the Monaco Historic Grand Prix races which will be held prior to the F1 Grand Prix, with practice sessions on the Saturday. This event is a celebration of the golden age of car racing, and takes place on the famous street circuit that has hardly changed since the first race on 14 April 1929. A series of races in 6 classes is scheduled for Pre-1947 Grand Prix cars, Pre-1961 Grand Prix cars (Front Engine), Pre-1953 Sports cars (Drum Brakes), 'Formula Junior' cars (Front Engine & Drum Brakes), Pre-1966 'Formula 1' cars (Rear Engine) and Pre-1977 'Formula 1' cars (3 litre non-supercharged). The Monaco Historic Grand Prix usually takes place two weeks before the Monaco Grand Prix. The cars race on the same street circuit and the racing is viewed from the very same grandstands. Not only are the grandstand prices much lower but driver and car access is also much easier; classic car enthusiasts of all eras mingle with the drivers and owners in a very relaxed fashion. Grand Prix cars and Sports cars dating from pre 1934 to pre 1979 are organised into 6 groups. Each group will take part in two official timed practices on Saturday. The Grand Prix is on Sunday when each race will consist of 10 laps or a maximum of 30 minutes. There will be 15 laps or a maximum of 40 minutes for the F1 - 3 litre race. The Fairmont Monte Carlo is one of the most famous in Monaco. This 4 star superior hotel is actually on the circuit facing out to sea. The hotel is a unique and prestigious complex offering 619 rooms and suites; each room has its private terrace overlooking the sea or flowering gardens. It provides an exceptional range of services and leisure facilities, including its own casino. There are only a limited number of rooms with a circuit view - please ask for details. The Columbus Hotel - formerly owned by David Coulthard - is a contemporary high-rise hotel facing the Princess Grace Rose Garden and the Mediterranean Sea. This superb superior 3 star hotel has 181 well appointed guest rooms and offers a restaurant and cafe, Bar and Nightclub and 24 Hour Room Service. The Columbus Monte-Carlo underwent an extensive renovation program which was completed in April 2018. The Novotel Monte-Carlo is situated at the heart of the principality, a short walk from the train station, the Place du Casino and the Grimaldi Forum. 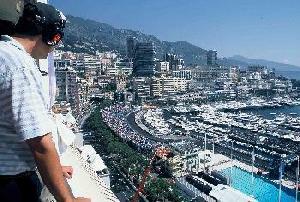 The hotel has 218 rooms (including 11 Junior Suites), some with stunning views over Monaco and the sea. Take time to relax in the hammam, fitness room and outdoor pool. The restaurant opens onto the garden and offers delicious Mediterranean cuisine. A private car park is available. You can view the Monaco Historic Grand Prix from one of the many grandstands along the circuit. Prices for weekend grandstands will be approximately £65-£70 per person. La Rascasse is an iconic part of Monaco, a renowned bar inside the last corner of the Monaco circuit which has its own corner named after it. The cars race around the perimeter of the building putting guests right in the centre of the action. Watch as the cars exit the swimming pool section and race directly towards Rascasse before going around the building just meters away. Your reservation will be on the upper floor where there are two terraces right above the circuit. One terrace is accessible to all guests for race viewing. 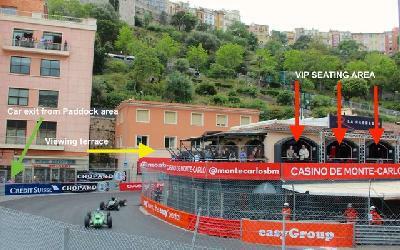 The second terrace is where ?the VIP seating is located (meaning having a premium view of the circuit from your seat). Non VIP guests will have a reserved table with a limited view of the circuit inside the venue but you can of course still access the viewing terraces, the viewing stair case and the ground floor for race viewing. There will also be TV screens throughout the venue showing all the racing action. Please note that there are only 4 VIP seating areas. Each "booth" consists of seating for 6 guests so in case you are a smaller party please be advised that you may have to share. These balconies are considered to be the best of the very many private balconies that look on to the Monte Carlo Circuit. Why? They are popular because they not only provide you with a prime view of the start finish straight but also offer exhilarating views of the whole harbour and beyond. 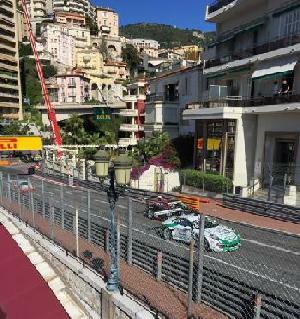 Race viewing includes St Devote, Tabac, Virage Massenet for Casino, the exit of the Monte Carlo Grand tunnel and the Rascasse corner. Additionally, the giant TV screen is visible from the balcony. Hospitality is based in the Miramar Hotel in the Condamine area of Monte Carlo. The hospitality is informal and views include the Monte du Casino and the Virage du Tabac.